Bonhams announced a Team Cunningham 1963 Jaguar E-Type Lightweight Competition Coupe, 24 Hours of Le Mans entry, for the Quail Lodge 2017 sale. The former Team Cunningham 1963 Jaguar E-Type Lightweight Competition Coupe, 24 Hours of Le Mans and Bridgehampton 500 entry, is an early car announced for the Bonhams Quail Lodge 2017 classic car auction during the annual Monterey Car week in mid-August in California. Once retired, the pedigreed racecar was displayed at the Cunningham Museum. Record prices were set for racing and non-competition Jaguar E-Types earlier in 2017. The 20th Bonhams Quail Lodge Auction will take place on Friday, August 18, 2017, at Quail Lodge in Carmel, California. It is hosted in conjunction with The Quail: A Motorsports Gathering. In 2016, Bonhams’ top result at Quail Lodge was $4,000,000 for a 1931 Bugatti Type 51 Grand Prix Racing Two Seater but the Quail Lodge auction record was set in 2014 when the 1962/3 Ferrari 250 GTO sold for $38,115,000 as the most-expensive car ever sold at public auction. The first headline car announced for the Bonhams Quail Lodge Auction 2017 is the former Team Cunningham 1963 Jaguar E-Type Lightweight Competition Coupe, 24 Hours of Le Mans and Bridgehampton 500 entry. As the factory effort that year for Jaguar, the Briggs Cunningham team flew the works banner at Le Mans in 1963 where this car – chassis number S850664 – made its appearance as Number 14. Team Cunningham entered three 1963 Jaguar E-Type Lightweight Competition Coupe in the 1963 Le Mans 24 Hours race. The car on offer completed only 8 laps, another did 40 laps with the third Jaguar finishing the race 9th with 283 laps completed vs. the 339 laps of the race-winning Ferrari 250 P.
Later, Team Cunningham would race it at the Road America 500 and then again at the Bridgehampton 500 where it finished fourth overall. Once retired, the pedigreed racecar was displayed at the Cunningham Museum and, after Mr. Cunningham sold his private collection, was later owned by noted collectors Lord Bamford, Paul Vestey and Campbell McLaren. 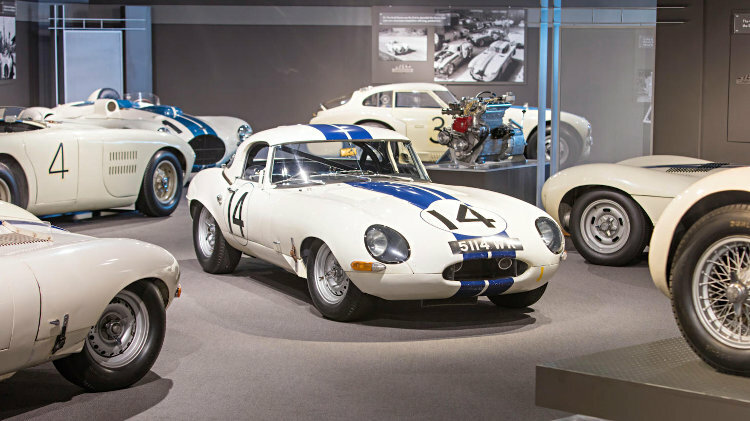 Known as the “GTO killers,” these lightweight competition Jaguar E-Types were faster on most tracks than the fabled Ferrari 250 GTO. As some of the most successful and iconic sports-racing cars ever produced, they are among Britain’s most celebrated cars and rarely, if ever, come up for sale. 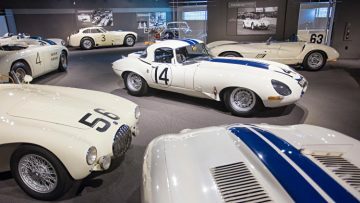 Bonhams has famously auctioned both the world-record Jaguar Lightweight E-Type and Ferrari 250 GTO and can attest to the significance of this machine. Featured in many books – indeed, claiming its own chapters – and even made into toy cars, the Team Cunningham #14 Jaguar E-Type is legendary. Genuine, highly original, well documented and eligible for most of the world’s great races, rallies and concours events, it is a car of immense distinction. 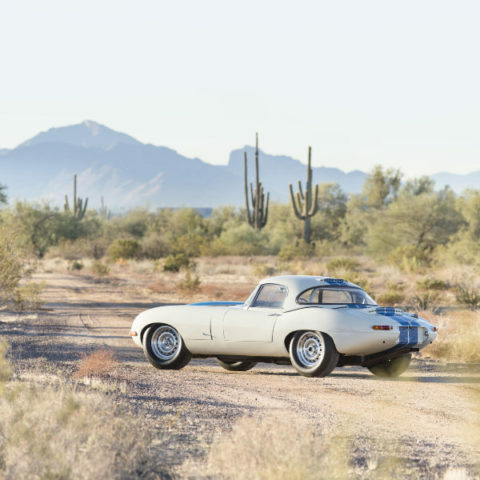 The auction record for an E-Type is the 1963 Jaguar E-Type Lightweight Competition that sold for $7,370,000 at the Bonhams Scottsdale 2017 auction. 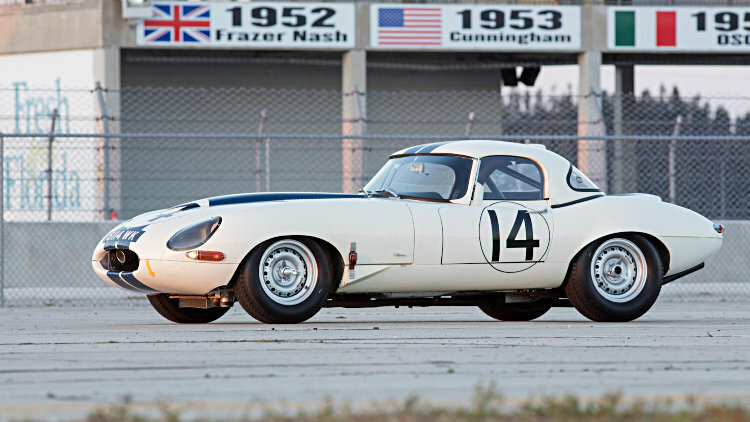 Only 12 of the Lightweight Competition E-Types were ever made making these cars rarer than the Ferrari 250 GTOs. This record 1963 Jaguar E-Type Lightweight Competition was campaigned successfully by Bob Jane in Australia but covered only 4,000 miles since new. For more on this car also see: 2017 Bonhams Scottsdale Jaguar E-Type Lightweight Competition Announcement. The world record for a non-competition model E-Type sold at auction is €582,400 paid for a 1961 Jaguar E-Type Series 1 3.8 Roadster at the RM Sotheby’s Villa Erba 2017 sale. Although a non-competition model, this car was successfully raced during the 1962 and 1963 seasons in Angola and Portugal.